Submitted by IPSC on Wed, 10/08/2011 - 12:54. On 6th April last, the Ireland Palestine Solidarity Campaign appealed to Riverdance to cancel its tour of Israel scheduled for 1-13 September next. 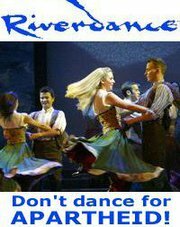 In response, Riverdance posted the following on its website: “Riverdance supports the policy of the Irish Government and indeed the policy of every other EU state that cultural interaction is preferable to isolation.” Significantly, all feedback comments were disabled for this posting. This response overlooks the fact that it is precisely the policy of EU states, i.e. their refusal to apply international law, international humanitarian law or indeed EU law (embodied in Article 2, the “human rights clause”, of the Euro-Mediterranean Association Agreement) to the state of Israel and their consequent complicity in Israel’s violation of these laws, that has made it necessary for civil society to call for Boycott, Divestment and Sanctions (BDS), including a cultural boycott, of the Israeli state. BDS is a non-violent protest strategy responding to the call by Palestinian civil society and cultural organisations for international assistance. Since last April, when the IPSC called on Riverdance to cancel its tour, Israeli soldiers have twice raided the Freedom Theatre in Jenin, in the occupied West Bank, thus jeopardising a planned production of Waiting for Godot by Samuel Beckett. Two board members of the theatre, Adnan Naghnaghiye and Bilal Saadi, and actor Rami Hwayel have been kidnapped by the Israeli military in the past month and remain in detention at the time of writing. “We don’t know why we are being targeted. We’re a cultural organisation fighting for freedom,” said Jacob Gough, the theatre’s acting managing director. On 29th July Israeli soldiers attacked the Dutch “First Night of Love Brass Band” with tear gas canisters during their performance near Nablus in the West Bank. On that same day Israeli soldiers assaulted and seriously injured the Palestinian photojournalist Moheeb Al-Barghouthi for filming a demonstration near Ramallah. These are just random and recent examples of the indiscriminate brutality of the Israeli occupation, which does not stop short of targeting cultural and journalistic freedom. This is the basis for the Palestinian call for Boycott, Divestment and Sanctions. Since Riverdance’s management seems determined to tour Israel, we now call upon the musicians and dancers who make up the Riverdance Company to refuse to participate in this tour, following the example of Riverdance set designer Robert Ballagh and the 208 Irish artists who have pledged to boycott Israel. We call upon them to inform Riverdance’s management that they will not be party to a breach of the boycott call from Palestinian victims of Israel’s crimes. We call upon them, as cultural ambassadors, to refuse to besmirch Ireland’s good name by lending themselves to exploitation by those who would whitewash Israel’s crimes against the Palestinian people.